Champagne Elegance (Nisswonger 1987 USA) M 33"
Standards are near white to pale lavender pink; Falls are buff Apricot. Amber Beards. Heavy bloomer and once established regularly rebloom's in Autumn. All New Zealand and Overseas Visitors to this site should if they want to know more information on Reblooming, also known as Remontants Irises should give serious consideration to Joining the Reblooming Iris Society the link is listed under Iris Links on this page and for $7.00 US annual or $18.00 Triennial subscription represents fantastic value (New Zealander's need to add $5.00 US for international post). In the next month or two I will feature a post from my point of view about membership of Iris Societies and which represent the best value and why. MISTY LADY, PROGRESSIVE ATTITUDE, PURE AS GOLD, ROMANTIC EVENING, SOME ARE ANGELS, and VINTER. 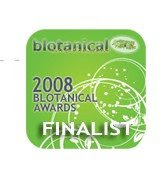 Blotanical is without a doubt a fantastic large directory of Garden Blogs all in one place. If you haven't already, give it a visit, but only if you have plenty of time to spare. Just click on the Blotanical Side Bar Button featured on this page.Enjoy!!! We have 16 clumps of the heirloom iris 'Magnolia' in one garden bed at home, which indicates the high regard I have for this iris and it's magnificent display. A high health, and vigorous grower and I always have requests for plants from people who visit the garden. Magnolia as most will know is the pod parent of Jean's most famous introduction "Pinnacle". In the year 1950, D'Arcy Blackburn, a Gisborne commercial grower of Irises, and a founding member of the NZIS, had this to say about Magnolia. "In the creams, although there are some good varieties coming through to us shortly, most of us have had to content ourselves with Magnolia one of the few of this colour we have seen. Magnolia, however, has many excellent qualities, being reliable blooming, of rapid increase, and with nicely formed flower on a good stalk.. We could do with more irises like it. It does not rot or show spot and the rhizomes planted one season unfailingly make their show the next. Alas, I have seen too many much heralded new varieties in irises take two to three years to make a worthwhile show in the garden. It will be a good iris that will supersede 'Magnolia'." One of the finest seedlings we have yet introduced. Very large flower's of classic form and parchment-like substance, carried on four foot well branched stems. The colour is a warm creamy white reminiscent of Magnolia grandiflora. A light yellow beard adds character to a charming flower. An extremely vigorous grower 4 ft. seven shillings and sixpence. MAGNOLIA 48 inches. M. Parchment substance, creamy white. Very fine. The Iris Year Book 1949 page 99, Irises in New Zealand, Jean Stevens. White irises are not yet generally popular, and in this regard the average grower of irises in this country is stubbornly conservative. Only one white iris, WINTER CARNIVAL could be called popular at this date. Strangely enough a light cream, MAGNOLIA, though an old variety, remains universally popular. MAGNOLIA Mrs J. Stevens, Reg., 1939. Sdlg.1/K34 TB, 48″, M, W4; E. Standards and Falls creamy white, soft reticulated gold at throat, light yellow beard. Good shape and substance but lacks branching. Description J Stevens Studbook notes,‘1937 flowering’; (Shasta X Mrs Valerie West). Stevens Bros Catalogue 1939-40. De Forests' IRISNOLL, Route 3, Box 363, Canby, Oregon. Latest Introductions 1969. 'A rich brassy green bi-colour with chartreuse lime standards and a brighter gold and olive-green falls. A unique and showy colour with excellent form. Beards are a radiant gold'. 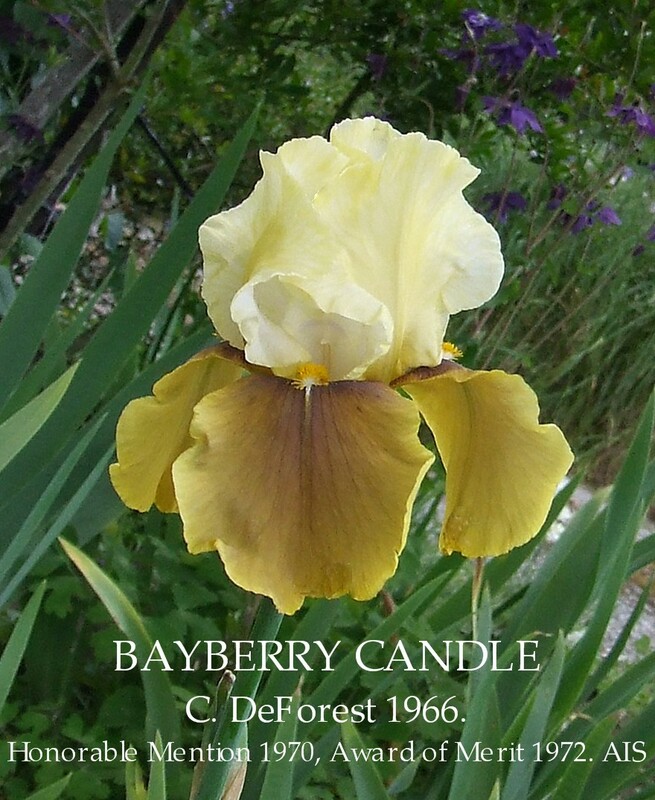 BayBloom Nurseries, Tauranga, The Connoisseurs Catalogue, Spring-Summer 1988 BAYBERRY CANDLE. The whole flower has a brassy metallic overtone. Almost brass green hued, it is a bi-colour with rich chartreuse standards and gold toned olive green falls with the colour intensified around the bright gold beards. A must for every iris collection. BAYBERRY CANDLE (C. DeForest, R. 1966) Sdlg. 66-19 TB 36” M Y3cm S. chartreuse to lime, white inside and styles; F golden olive-green, deeper centre; brown beard (Dawn Crest x S8-38) X (Mary Randall x Golden Chance), Irisnoll 1969 HM 1970, AM 1972. Photographed growing at home and it sure is a beautiful Iris when it blooms. Not well known as it is a slow increase for me,and most New Zealand commercial grower's did not sell it, the grower I purchased it from has closed his business,but if you can find someone who is selling it I recommend that you buy it, in my opinion it is justly named "Maple Treat". Waimate Iris Garden, Waimate, South Canterbury. Final Catalogue 2007. MAPLE TREAT Opal Brown,1995. Rich medium brown. Short supply again. Cayeux, La Carcaudière, Route de Coullons, France. Iris Lover's Catalogue, 2013. A good son of the variety ‘Caliph’. Medium brown standards and lighter orange-brown falls, paler below the deep gold beards. Rich colour, excellent garden value. MAPLE TREAT Opal Brown, Reg. 1995 Sdlg. 91-8E4. TB, 28" (71 cm), M. S. medium brown (RHS 166A); style arms medium brown; F. lighter brown, paler (166D) below beard; beards deep gold, thick; ruffled.Caliph x Indian Caper. Brown's Sunnyhill 1995. Another Jean Stevens iris growing at home.This is a strong and vigorous plant which shows strong Purple bottom foliage. As the rules of the AIS checklist requires that should a Iris be named after a living person written permission from the person concerned is required. Jean duly wrote to Winston Churchill seeking his permission to name this iris after him, and received a letter back from the Prime Ministers Private secretary on behalf of Winston Churchill giving permission to do so. The reader should take into account that this was just at the time when all the politics that led to the start of World War 2 was happening. The listing of Winston Churchill on the HIPS web site has a notation that it "only flowers once every three or four years" this will come as a complete surprise to the many people growing this Iris in New Zealand as it is a rather puzzling statement because every year this Iris is covered in blooms, and is my opinion that should it had only flowered once every three years, Jean Stevens would have tossed it on the compost heap and it would never have been introduced such were the standards she set. Steven's Bros. Catalogue Bulls, Introductions, 1942-43. Patiently through the years the breeder works, trying to lead nature along the road he desires her to travel. Ruthlessly he destroys their efforts to stray aside from the goal on which he has set his heart. Nature, true to her reputation, as inconstant, and often perverse, but just once or twice in a generation will give a generous and compliant aid in the right direction. In 18 years of breeding for true red irises we have worked through many generations of varieties, selecting those nearest in colour,discarding all others. Almost imperceptibly the idea was coming nearer and nearer, until at last nature has come to our aid, and we are able to offer this lovely result of hour-long work. WINSTON CHURCHILL (Stevens 1944) ML. 32"
A striking new red Iris. A solid color close to crimson, it gleams with a jewel-like lustre. Compared with the reeds regrow it is deeper and the color singles out as being different. Color and texture are very fine.the standards are more a glowing copper-lit red, the falls pure crimson velvet with a gold beard. Very impressive and distinctive in a class where many varieties are confused because of their similarities. Glowing and alive with colour, like some of the rich crimsons in the priceless paintings of the old masters. Winston Churchill is a masterpiece of colour and texture. The standards of an effulgent, copper-lit red, enliven the dark pure red, velvet falls. 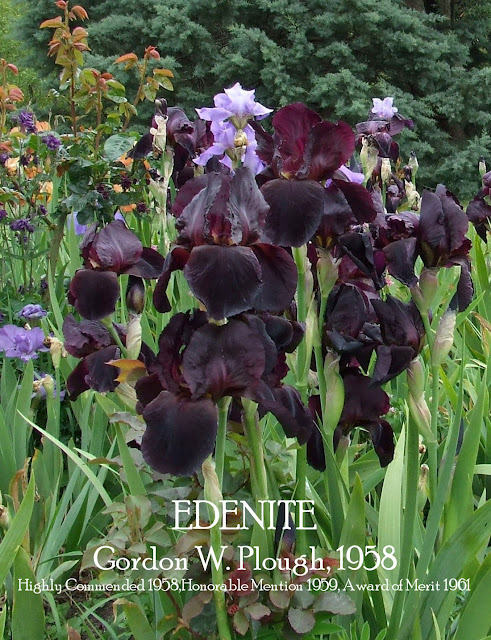 This lovely iris has created considerable enthusiasm in America, being of a rich tone of red, and very distinct. TRIBAL TORCH flowered for me last season and intrigues me no end. First, the very involved Parentage and it's genetic code is made up from some very good irises. Frank Hutchings used a lot of Jean Stevens varieties in his breeding program, so as you can see below 'Pinnacle' is in the parentage of 'Tribal Torch' 5 times and then there is also an appearance of 'Finest Hour'. Undoubtedly ahead of its time with its variegata colouration and it's now referred to broken colour splashes on the standards. Secondly, concerning the registration description just how do you get a self beard on a bicolour??? Additional information added below from Tell's Gardens' Catalog adjusts this beard colour oversight. Many of you may grow Frank's well known 1973 introduction 'Festive Skirt' a Pink Amoena which is another top Iris and has 'Pinnacle' and 'Sunset Snows' included in its parentage . I am most pleased to have both of these irises in my collection.You will also note Tell Muhlestein's catalogue comments that 'Tribal Torch' is fertile both ways, but I can find no registered Iris that has it included in it's parentage, could this be an opportunity for someone??? Tell's Garden's Orem Utah. 'We proudly present our 1971 Introductions'. This great flowering Red Black iris grows in a large clump at home and puts on an amazing early display. Vigorous growth with clean light green foliage. Blooms are a super smooth deep red-maroon black, velvety, a true self and are the epitome of elegance. Large and rounded full form. Not commonly sold commercially in New Zealand. It was originally sold to me labeled as "Black Swan", but that label was put to rest the day it first flowered. Eden Road Iris Garden, Wenatchee, Washington. 1959 introductions. EDENITE--- EM. 30 in. ( Great Day x Sable Night) Entire flower is deep red-black with falls having a sooty black appearance. Flower is large with wide petals. Fertile both ways. H.C. '58 ...........................$35.00 net. Schreiner's, Salem, Oregon, Iris Lover's Catalog, 1964. 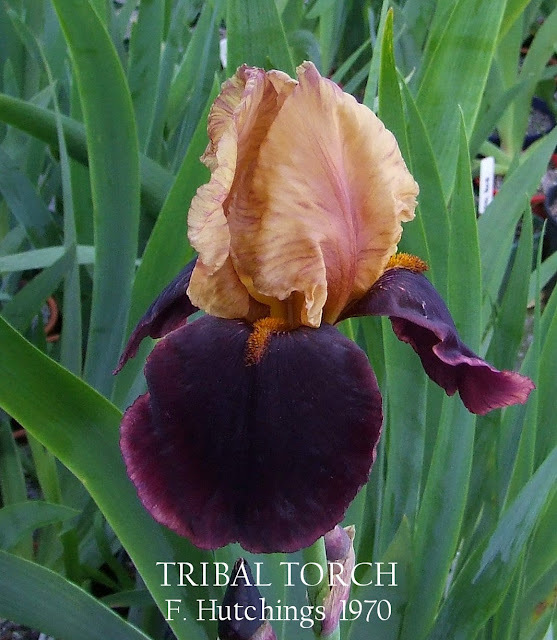 Here is a startlingly different dark iris. Absolutely different from other dark's in that it is a deep, intense, almost sooty deep red-maroon. Crisp, closed standards and flaring falls. Sombre and attractive.HM 1959. AM 1961. Cooleys Gardens, Silverton, Oregon. Iris Catalog, 1963. 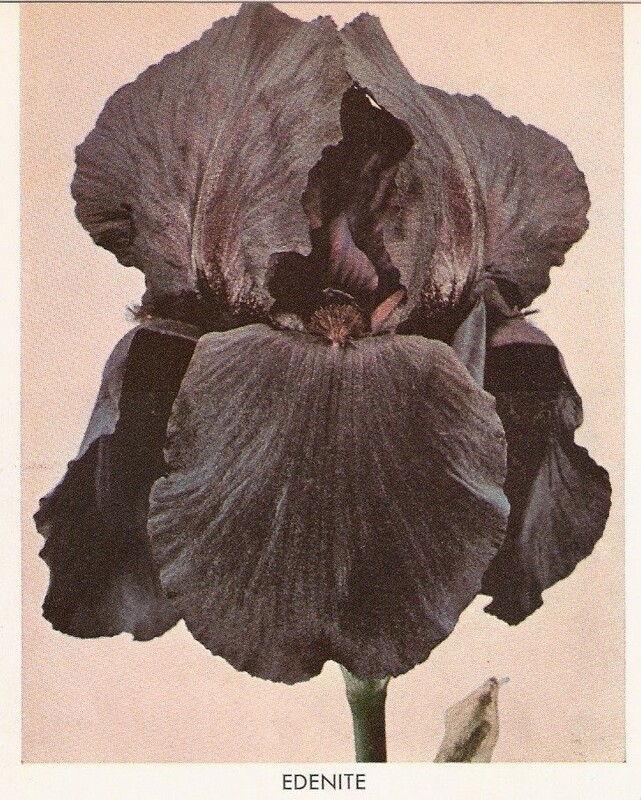 'Sooty' black with a deep red undertone; a seedling of Sable Night The uniform blackness of this flower immediately attracts all who see it in the garden. Domed standards and flaring falls. Blooms rather early. Schliefert Iris Gardens, Murdock, Nebraska, 29th Annual Catalog, 1970. EDENITE (Plough, '59) A large sooty black, from the red side. The entire flower is a deep red-black with the falls having a sooty black appearance.A.M. '61. EDENITE (Plough, R. 1958). Sdlg. 55-11-14. TB 30" EM. RN1. Sooty red-black. Great Day x Sable Night., Eden Road 1959. H.C. 1958, H.M. 1959 A.M. 1961. The DUKE OF BEDFORD raised by Arthur Bliss 1922 is an amazing Iris to view.Good increase, handles the weather well, and has many hues of purple depending on the time of day and the position of the sun. The Picture is taken at a vineyard just down the road from home and is growing in a position where it gets the full force of the southerly winds,its roots are in poor soil with not much moisture just a little shade from the shelter belt that it is growing under yet every year puts on an amazing display of bloom. DUKE OF BEDFORD (Bliss 1922) A velvety deep purple bicolor. Color...........Notable for strenght and depth rather than brilliance. 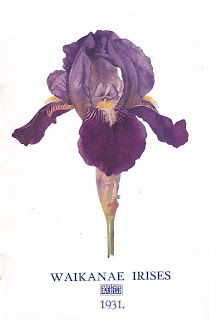 I have set up this blog to help promote Historic Irises in New Zealand without the baggage of belonging to a New Zealand Iris Society. I will try and post weekly with interesting stories of Irises growing in great Gardens in New Zealand. I Consider Jean as New Zealand's premier International Hybridiser but not so much is known about her within New Zealand yet she is still highly regarded overseas. Historic Tall Bearded Irises grow well in all parts of New Zealand and are well worth growing.